Author’s note: I played the Sapling 1.1.51 build of Staxel during its Early Access phase. While this review provides my impressions of the version I played, it’s possible the game may have changed substantially in subsequent iterations. I should probably get this out of the way up front: I have never played Minecraft. There, I admitted it. I’ll also admit that I am a big fan of Harvest Moon: A Wonderful Life, though I’ve never played any of the other entries in the series. Now that we’ve got that out of the way, it might help you understand my thoughts on Staxel a little bit better. You see, Staxel strikes me as the kind of game we’d get if Minecraft and Harvest Moon got together and started a family. 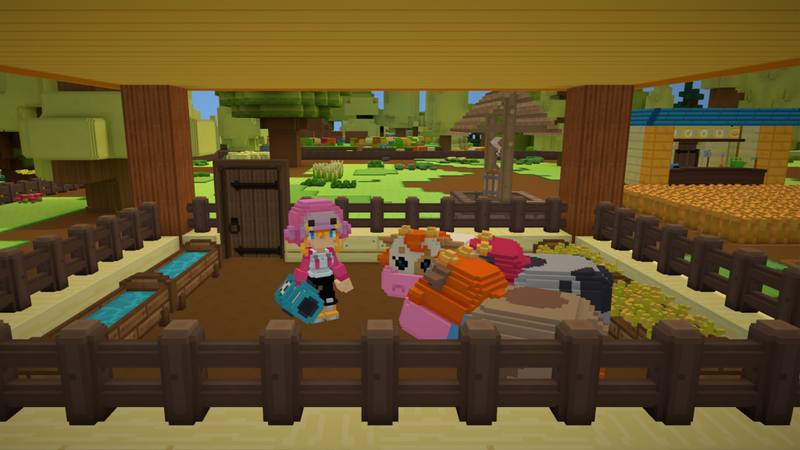 Staxel takes the aesthetic, crafting, and creative freedom of Minecraft and combines it with the farming and community-building aspects of Harvest Moon, and the result is a fun and cute – but deep – experience. It seems to me that Staxel has really taken the best of both worlds and created something special. While the game still has some flaws that keep it from being something I’ll pour a great deal of time into, given that it’s currently in Early Access on Steam, developer Plukit may address some of these issues in future updates. That being said, I evaluated the game based on the state it was in when I played it, not based on what might come to be in the future. Staxel’s premise is based on you, a young man or woman, who has inherited a small farm just outside of town. 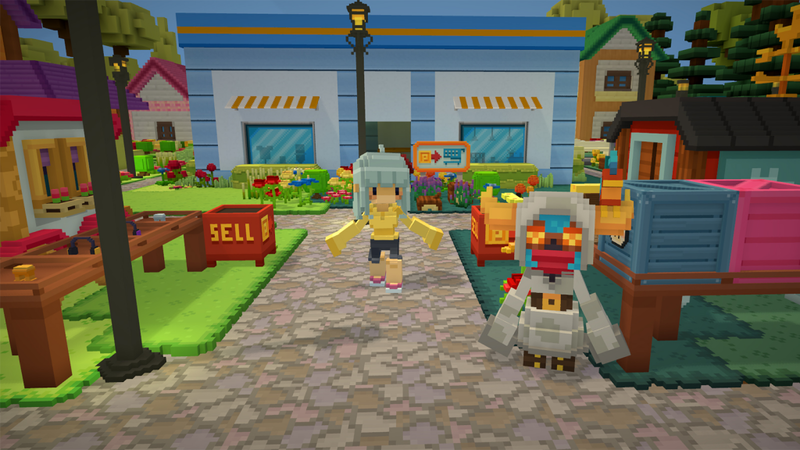 The game starts out by allowing you to create a character, who is then welcomed into his or her new town by various townsfolk and led around by an enthusiastic fan of farming who introduces the player to a number of landmarks as well as basic game mechanics. The tutorial portion of the game was a perfect length, providing the need-to-knows without getting overly long or complex. One thing that was noticeably missing was a section dedicated to crafting, which seemed odd to me given the importance of this mechanic to the overall gameplay. Only upon exploration and after talking to various townspeople did I discover a store in which I could buy blueprints and use machines to craft new materials. While this may be by design, I felt that I was lacking some key information, particularly around blueprints – are they only available in this one store? Can I find them in the wild? If I experiment with crafting, will I discover (and then automatically memorise) the blueprints for the items I create? These questions were largely left unanswered. When I did experiment and create something new that I didn’t have a blueprint for, the information on how to re-create it wasn’t added to my inventory, which I felt took away any reward for experimentation with the system. If I was unable to remember the steps I took in trying various combinations, then I was unable to reproduce the item a second time. It’s possible that this is standard practice in games like Minecraft, however to me it presented a gap in knowledge that would have made the game’s beginning more enjoyable – or at least less confusing. While some information was left out, I was generally impressed with the crafting system. There are several different types of “tool benches” of sorts that the player uses to perform different tasks and generate various products. Recipes and blueprints that are “memorized” (done simply by buying or picking up the document, then left clicking) are handily available in an inventory tab, and can be pinned to the screen/user interface (UI) to facilitate speedier crafting and allow the player to avoid constantly opening up the menu to see the next step or materials required. Some stations can also be set to work and left running unsupervised, which allows the player to carry out other tasks while the more mundane activities are completed in the background (e.g., sawing raw wood into lumber). 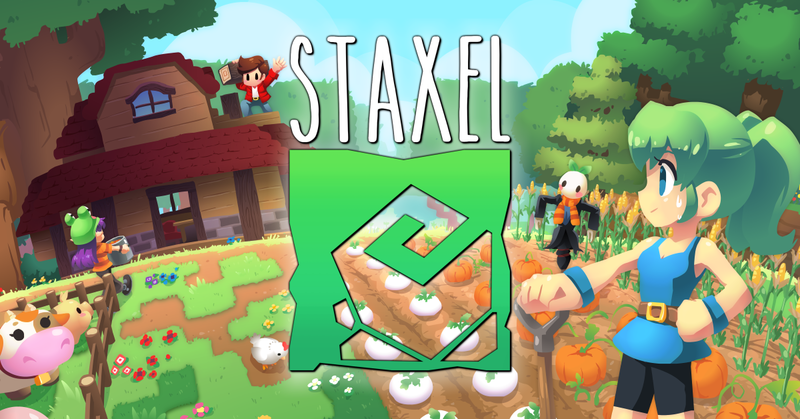 Staxel mitigates the more menial tasks – such as planting, watering, and harvesting crops, or taking care of animals, very well – by ensuring that they’re quick and easy to do. The player has the freedom to take on more (or fewer) activities according to their tastes thanks to the ease of performing the “chores”. Watering crops is an incredibly fast process due to the responsiveness of the mouse and keyboard controls, the speed of the player’s movement, and the design choice for a square to be considered “watered” by basically pointing and clicking (no animation required). The simplicity of performing these tasks enabled me to go about doing what I wanted to do (even if that meant doing more and more planting, watering, and harvesting of crops). Mechanically, the game handles very well. 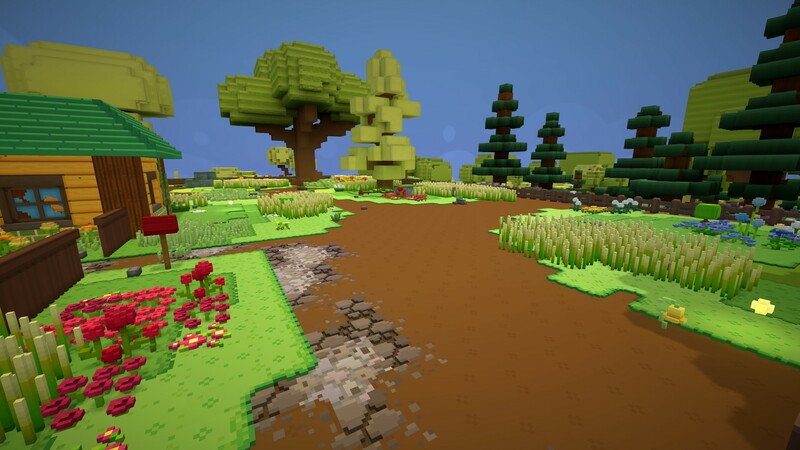 It is playable in either first- or third-person views, and its voxel art style ensures that it runs smoothly even on modest hardware. It also features controller support, though as mentioned I favoured the mouse and keyboard control scheme since I felt it facilitated speedier completion of a variety of tasks. In addition, the UI is simple and easy to use, and inventory management is a breeze. I do wish that some things were explained a bit better (e.g., right click to pick up half of the quantity of an item in your inventory) but I was able to discover the key functions with just some simple experimentation. 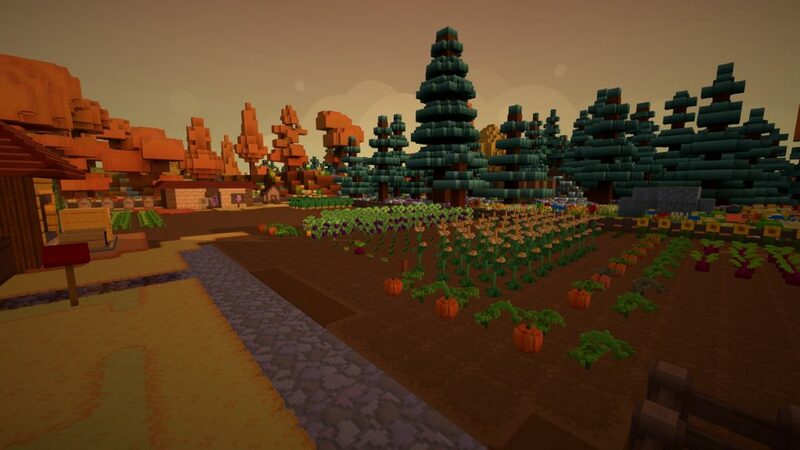 The length of the in-game days and seasons feels well balanced, with each lasting long enough to complete the necessary daily farm chores and have time left over for “extracurriculars” such as exploration, crafting, and performing tasks for the various townsfolk. Of course, if one doesn’t want to engage in the day-to-day monotony of a farming operation (and I say this entirely tongue-in-cheek, as it’s quite possibly my favourite part of the game), there’s complete freedom to go about partaking in any number of other money-making endeavours, such as bug-catching, fishing, shell-collecting, or even theft (which the game told me has consequences, though I apparently never stole enough to find out what those were). One feature I felt was sorely lacking was the ability to look at a calendar on demand, as currently the player is only shown one while sleeping. This occasionally left me wondering how long a particular festival would last for, or how long the seasons were (which admittedly was only an issue for the first couple of seasons, before I caught on to the fact that they’re all 16 days long). Each of Staxel’s four seasons has a unique look and feel to it, and as I progressed through the year, the depth of the farming system was also revealed to me. There is a substantial variety of crops to be grown, each with its own time frame for reaching maturity. There are also crops that will yield multiple times after reaching maturity, until the season is such that the plant can no longer survive. This presented an opportunity to get a bit strategic with the farming side of things, as I was able to plan out which crops to plant when (and where), and how to get the most bang for my buck on seeds. After starting out with a small patch of cleared land, I quickly expanded to using almost the entire section of land within my fenced-in area, which was aided greatly by my purchase of a seed maker. That being said, as with almost everything in Staxel, you can jump in as deep, or as shallow, as you wish with the farming mechanics – it just so happens that farming is kind of my thing. In addition to farming and other more exploratory-type activities, the townsfolk in Staxel also present various tasks, ranging from finding lost items to building entire new houses or stores, which add to the sense of community and make you feel like you’re really helping to rejuvenate the town and make people happy. This plays into the lore of the game, which I felt was very well done. I was given just enough information and chit-chat to understand the goings-on in town, but left with enough room to use my imagination to fill in the blanks. This is just another area where I felt that the game did an excellent job of blending the more story-heavy nature of Harvest Moon with Minecraft, which is devoid of any backstory whatsoever. Overall, while I did enjoy helping the townsfolk, I felt as though the game would benefit from some sort of quest-tracking mechanism to ensure that the player doesn’t forget about things that have been asked of them and the time frames they are required to be completed within, as on more than one occasion I would chat with a townsperson who informed me that they no longer required my services, as they’d already done whatever they’d asked of me (that I’d promptly forgotten about). Yet another aspect in which Staxel shines is in its clever use of what I like to call “structured freedom”. For instance, when constructing a new building (such as a barn or a house), the player is given a sign to place wherever they’d like to construct it. The sign identifies the type of building, dictates the minimum requirements (e.g., a door, 2 windows, a certain number of roof tiles, and a feed trough), and sets out the area within which the structure must be built/contained using semi-transparent yellow lines. I thoroughly enjoyed this approach, as it gave me clarity in determining which materials to use, but allowed me freedom in establishing just how I would go about building the structure, and what it would look like. The building itself is intuitive and quick, and any mistakes can be easily rectified. Build a barn of your own design, and put some bovine friends inside! After having played through approximately one in-game year, I can safely say that I have thoroughly enjoyed my time with Staxel. However, at times I feel like the game has significant depth, while at others I feel as though I’m on the cusp of exhausting most of what the game has to offer. There game seemed to lack any sort of overall goal or ‘end-game’, as after a couple of seasons I quickly found myself able to make substantial amounts of “petals” (the in-game currency) and create a relatively large-scale farming operation. Outside of the farming, periodic exploration, and assisting townsfolk, I wasn’t quite sure what to do next with my “spare time”. While I realize that Minecraft and others like it don’t really give the player an overarching goal, I felt as though Staxel would benefit from this given the way in which it starts – with the player inheriting a run-down farm. One additional gripe that I have with the exploration side of the game is that the player isn’t provided with any type of map, and if you’ve been running around the island’s forests, mountains and beaches for a while, everything starts look the same. As I understand it, this is similar to Minecraft’s approach, however I believe that Minecraft allows the player to craft a map if desired, whereas Staxel doesn’t even seem to provide the ability to craft a map (at least not that I discovered). This meant that occasionally I found myself teleporting back to my home – which is a very welcome feature given the lack of a map – when I would have rather simply found my way there with a little cartographical assistance. In addition, exploration overall isn’t terribly rewarding, as there isn’t enough out there on the island to justify spending a great deal of time looking around. For instance, I discovered an abandoned mine, but when I took to expanding the half-completed mine shafts and tunnels, I didn’t come out with anything other than stone and dirt to show for my efforts. I imagine that additional materials may be added in later to entice players to engage in these types of activities, but it’s not there yet. I believe that Staxel contains an excellent foundation for a deep experience, but Plukit likely just hasn’t had enough time to build out the robust features that the game hints at. That being said, it seems as though Staxel is well supported, as I’ve seen several small updates and one larger one applied to the game in the roughly 4 weeks I’ve been playing it. The game’s listing on the Steam Store indicates that Plukit intends to continue providing content additions to the game well into late 2018 – taking into account player feedback – and its Steam forums appear to be active with both developer and user posts. Modding is also supported, so players can create things they wish to see in the game as well. Staxel provides a combined sense of structure and freedom that gave me an entertaining sandbox to play freely within, but with enough direction that I didn’t feel as though I was always having to create my own fun. While all the pieces may not be in place yet and I felt some things were noticeably absent, the current version of the game is enough to keep you entertained for a healthy amount of time. As a fan of farming games and cutesy towns, Staxel hit the sweet spot of an addictive loop of crop growth and farm expansion, with numerous side activities to keep me engaged. Staxel is an interesting mash-up of games like Minecraft and Harvest Moon, and it shows enough promise to ensure that I’ll be keeping an eye on how it develops from here.